Swarm Blog: Romanian Android Fun With "Te Crezi Destept?" "Te crezi destept?" created by the up-and-coming Happy Face Devs is a fun and popular new game-show like trivia Android game for the Romanian language. Players can prove their knowledge, compare scores with the other players aruond the world, unlock cool achievements and much more! If you're looking to improve your Romanian, you're a native Romanian speaker, or you simply enjoy mastering new challenges, then you should check out "Te crezi destept?"! 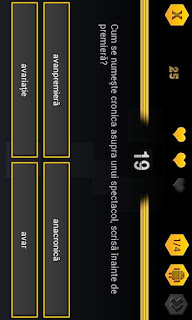 Labels: Achievements, Android, Happy Face Devs, Leaderboards, Swarm, Te crezi destept?